Tests World > Celebrity tests > Quiz: Which celebrity wedding will mine be like? Ever wondered if your wedding could be like a famous celebrity couple? Well take this quick and easy marriage test to find out for sure! What's the most important part of your wedding? Do you want to be treated like a princess on your big day? Of course! That's what a wedding is about! What will your dress be like? Do you want outsiders (from your friends and family) to know that you are getting married? Do you want a big lavish wedding? Do you want people to be envious of your big day? Of course! I want to show off! Would you want loads of pictures for social media? Of course! Why should social media miss out on my wedding? Who will be invited to your wedding? Would you like someone else to plan your wedding? Do you want a very traditional wedding? You will have a big lavish wedding like Katie Price’s wedding to Peter Andre. You don’t do things by halves and you want the world to sit up and pay attention to your grand wedding. You want the Princess treatment and everything will be just perfect. You will show your love for each other in a very nontraditional way and you aren’t afraid of doing things differently. Don’t be put off because Katie and Peter’s marriage didn’t last, with this wedding you are sure to have a marriage and memories for a lifetime! You will have a wedding like Prince William and Catherine Middleton. A very grand wedding but very classy. You make it all about your friends and family and the people you care about most. You’d rather not be the centre of attention but you do your best to please others. The main aim in your mind is just you and your partner. It is a very traditional wedding and you adapt it to please those around you, but it is still a very special moment. You will have a wedding like Jennifer Aniston and Justin Theroux. It will be a very quiet and personal wedding with the main aim being for your friends and family. You want a very low key wedding with very little attention. You feel it should be a personal and intimate ceremony with just close family and friends, and you want your friends and family to enjoy the day as much as you do. You’d rather not have outsiders knowing about your big day, but be careful who you tell incase someone lets the cat out of the bag! 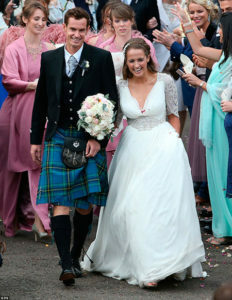 You will have a wedding like Andy Murray and Kim Sears. You like a very traditional wedding and everything is about sentimental value and family traditions. You will get married in a place that means something to both you and your family. Your wedding is dedicated around family and friends and you’d prefer to keep it low key. You aren’t bothered about what anyone else thinks as long as you and your family are having a good time. We've all seen the celebrity weddings in magazines and newspapers and admired at how wonderful they look from the pictures. Do you ever wonder if your wedding will ever be like that? Thanks to this love quiz, you can find out if your wedding will be fit enough to appear in the top celebrity magazines and be the envy of all your friends. Do you think that your's could be like a famous celebrity couple? Take this quick and easy test to find out!